Use the php script edition stand alone or integrate it with your php website, members base. Find on this page: demo, installation instructions, customization and integration specifications, how does it work . On the simple php script demo you'll be able to create an instant one on one video consultation room, get the invite link and enter video consultation to wait for the other participants to join. After entering as moderator, click any participant in list (can be yourself) and Set Speaker to show on main panel. Before installing, make sure your hosting environment meets all requirements. This edition requires the specific document conversion requirements for importing document as slides (PPT, DOC, PDF) slides and video conversion requirements for video upload. Get your own RTMFP path (i.e. by registering for a free developer key from Adobe Cirrus) and fill into settings.php as $rtmfp_server . Using a shared key can result in interruptions and group limitations. If you don't use suPHP, enable write permissions for "uploads" folder. Software generates a consultation room link that can be sent to other parties using any method (email/text messenger/sms). By using that link participants can access the online consultation room that includes high definition live video, file sharing and multiple discussion and moderation tools. No downloads are required. All is browser based and works on almost any platform (Windows, Mac OS X, Linux). Edit interface including skins, icons, sounds, logo, background in templates/consultation . This can be integrated with your members database and login system. Variables like username, loggedin (1 if user was logged in and allowed to enter, 0 otherwise), welcome message, streaming settings, available panels, features for regular users are passed from c_login.php . For advanced integration see the integration tutorial or professional integration services. &publicVideo1=user1&publicVideo2=user1... - Assign default user videos to show in public video panels (starts automatically if moderator does not assign another video to that panel or closes it). &videoRecorder=1&videoControl=1 - Allow video slides and controlling video streamps (pause/reload). 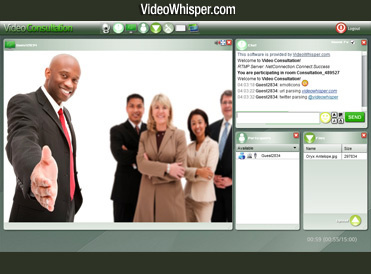 &p2pGroup=VideoWhisper - Group name. All users in groups are used as needed for transmissions - so you can have same group for multiple applications to improve spread and broadcast. &supportRTMP=1&supportP2P=1 - Allow using these protocols for streaming. &alwaysRTMP=0&alwaysP2P=0 - Force broadcast even if there are no subscribers. Use alwaysRTMP to make sure all sessions go trough server (for archivign). Warning: Broadcasting to both protocols requires double streaming bandwidth. Integrate pay per view, pay per minute functionality in c_status.php script called by each user session periodically (5-15s).